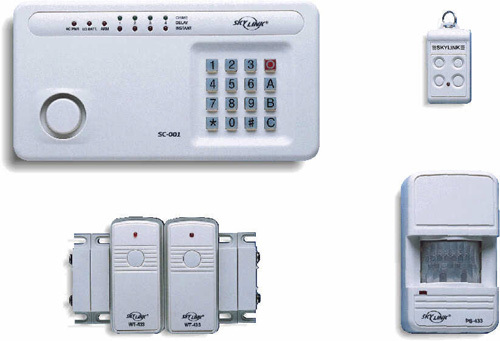 This system is a 4 zone system, utilizing One Motion Sensor, Two Door/Window Sensors and One Keychain Control, AC adapter, Backup Battery, User Manual and Quick Guide…can install up to 24 Sensors, 6 Keychain Controls or Key Pad Controls. Password is controlled by One MASTER Password and Three USER Passwords. Control Panel has a built-in Silent Help password when help is required. Built-in defensive system sends the signal before any damage or breakage can occur. This system is good for home owners & business owners. Deluxe Kit (SC-100) includes: control panel, motion sensor, two door/window contact sensors, 4B434 Keychain Transmitter, AC adapter, batteries, instructions, and all mounting materials (Velcro & screws). DIY Wireless Security System – Easy to install and ready to use, no programming is required. Rolling Code Technology – Leading edge radio control technology, provides maximum security and reduces false alarms. Ideal for homes, apartments, offices, businesses, and condominiums. This system is good for most small to medium size homes (i.e. approx. up to 3000 square ft.). For larger homes, more accessories can be added in order to cover the entire premises. Works in conjunction with up to 30 Skylink security accessories (including the Dial Alert unit). When the siren goes off, it will immediately send a signal to the Dial Alert unit (sold separately) which will activate the system to automatically call the preset phone numbers programmed into the system. Can be customized to suit individual specific needs. Arm/Disarm using PIN or a Keychain Transmitter. Includes a piercing 110 dB siren. Lighted keypad with Chime, Instant, or Delay modes. Low battery indicator LED light. AC power with 9V Alkaline battery backup (included). This system is very easy to install and user friendly. All accessories are programmed to the control panel by the manufacturer. Just mount all sensors and control panel on the wall, door or window, then test and use.